George Bye, with his namesake company, Bye Aerospace, is involved in projects ranging from solar-powered drones to 345 mph VTOL cross-country cruisers. People are betting on the plausible success of George’s SunFlyer 2, built by subsidiary Aero Electric Aircraft Corp. (AEAC), and he’s received deposits on 105 of the two-seat training craft. Due for release in the next two years, one prototype nears test flights this year. 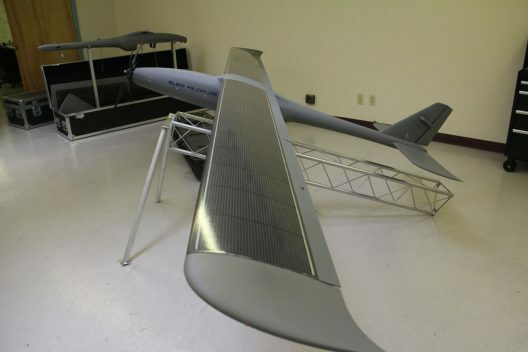 As its capabilities are demonstrated, Spartan College of Aeronautics and Technology might increase its initial reservation for 25 SunFlyers. Think of the impact this will have on flight training schools when SunFlyers and Alpha Electros begin delivering new pilots. Complementing George’s writeup in the IEEE journal, Sport Pilot, a publication of Recreational Aviation Australia (RAAus) gave the SunFlyer 2 a feature article and the cover of its November 2017 issue. This comes as Joshua Portlock of Aero.Electro is scheduled to be the first recipient of the electric trainer. The larger SunFlyer 4 will offer four seats, and is under development with over a dozen reserved. StratoAirNet is a modified Windward Performance DuckHawk (no longer in production, sadly), a high-performance 15-meter (49.2 feet) span sailplane recently completing successful ground tests for the SolAero solar cells on its wings. These triple-junction cells have a maximum efficiency of 32 percent, which enables an output of up to 1,560 Watts per kilogram (709 Watts per pound). On the ground, the cells produce one kilowatt, but at altitude, will probably generate up to 1.3 kilowatts, according to George. On the StratoAirNet test vehicle, they will power a modified Emrax 208 motor from Slovenia. Weighing a little over 20 pounds, the liquid-cooled motor can produce 40 kilowatts (53.6 hp) ccontinuously, great for a quick climb to the airplane’s surveillance altitude. George thinks the airfoils on StratoAirNet display an almost unbelievable artistry, part of the same artistry that allowed designer Greg Cole to produce the unique airfoils for the Perlan sailplane, which recently set a world altitude record of 52,172 feet over Patagonia. Since the “atmospheric satellites” that will come from this prototype’s tests rely on advanced solar cell technology for part of the mission, George and his partners foresee great things from the project. “The integration of the advanced SolAero solar-cells on the StratoAirNet prototype launches the initial demonstration phase of an entirely new paradigm of highly efficient solar-electric UAVs”, said George Bye, CEO of Bye Aerospace. Bye said potential commercial mission applications for the StratoAirNet atmospheric satellite include “communications relay, internet service, mapping, search and rescue, firefighting command and control, anti-poaching monitoring, damage assessment, severe weather tracking, agriculture monitoring (“precision ag”), mineral source surveying, spill detection and infrastructure quality assessment”. On a smaller scale, but no less challenging, Silent Falcon will combine drone technology with SolAero products to enable five-hour flights, boosting the little bird’s persistence. The less-than-paper thin solar sheets are 50- to 140 µm (micrometers or microns) thick and weigh a mere 280 grams per square meter (.058 pounds per square foot). Silent Falcon’s suite of electro-optical and broad range sensors enable surveillance and monitoring for a variety of civil and military applications. This versatility should make Silent Falcon a growing presence in the sky. George, along with CEO Charlie Johnson, provides engineering consultancy to XTI Aircraft (eXtended Technology and Innovation). A two-thirds-scale prototype will fly in the fall as a proof of concept demonstrator for a vertical takeoff and landing (VTOL) craft that will traverse up to 1,200 nautical miles (1,380 statute miles) instead of rooftop to rooftop hops for smaller commuter craft. Three ducted fans, one buried in the fuselage, provide the vertical capabilities, while the two fans on the wings rotate to provide forward thrust shortly after liftoff. Sliding doors conceal the fuselage rotor shortly after the airplane begins moving forward. George says reducing the window in which the airplane uses all its thrust to gain altitude allows the hybrid craft to gain its maximum 29,000 foot cruising altitude in only 11 minutes. With single-pilot instrument flight capabilities, the TriFan 600 can equal or beat airline door-to-door times without taxiing, long holds, or TSA checks. In a final note, “The Santa Monica Airport Association and the airport’s Museum of Flying will host a public event on Saturday, Jan. 20, featuring George Bye, CEO of Bye Aerospace, who will discuss the benefits of electric flight and the future of flight training. Since Santa Monica is facing the reduction in length of one runway, George’s quick-climbing SunFlyers will doubtless be welcome, and a few XTI 600s would be icing on the cake.